One of the things that I inherited after my dad passed away was alot of books. He, like me, was a voracious reader, and had a very large and diverse book collection. “The pastor was dressed in a gown that looked much like one that I recognized from the many times I watched Robert Schuller preach at the Crystal Cathedral. I wondered if they were from the same denomination. Research revealed that the Crystal Cathedral was part of the Reform Church of America. Research also suggested that there was a connection between the two denominations, but after just 12 weeks of my journey, the different denominations were not crystal clear, no pun intended. In any case, it was a nice gown. The Crystal Cathedral was another one of the diverse spiritual inputs that left an indelible mark on me and my spiritual development. Its special brand of “possibility thinking” was part of my life for many years. My father supported the ministry with many tithes and offerings, and were part of the church’s Eagles club which was constantly sending eagles figurines to the house to say thank you for my father’s consistent support. I remember a house filled with these eagles. There was never ending possibility and positivity and we steeped in it. Until one day, my parents went to an event where they actually met Robert Schuller. As the story goes, my father, who was ever the proud African man, asked Dr. Schuller when he would take the ministry to Africa. The response, unfortunately, had something to do with Dr. Schuller stating that if my father would consider donating funds, this could be considered. After a lifetime of supporting Dr. Schuller and his ministries financially, my father did not find this to be a satisfactory response; in fact he found it offensive (as did I when I heard about it). In the inside of the book, in my father’s handwriting is his name and the date 8/89. He, like I, tends to write the date inside the cover of the book, after he finishes reading it. In 8/89, I was packing my bags, leaving Atlanta to head to Palo Alto, California for my first year of college. I remember being thrilled, excited to be headed to a place that I had dreamed of for years. 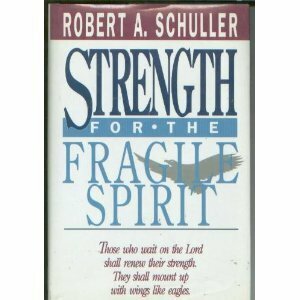 Who knows why he felt he needed “Strength for (a) fragile spirit.” at that particular time. Perhaps he was missing me already, even though he knew I would soon be in a great place – the next phase of my life was beginning. Just like today, I am missing him, although I know he is in a better place, and he is in the next phase of his life – the afterlife. « What is your favorite inspiring book?